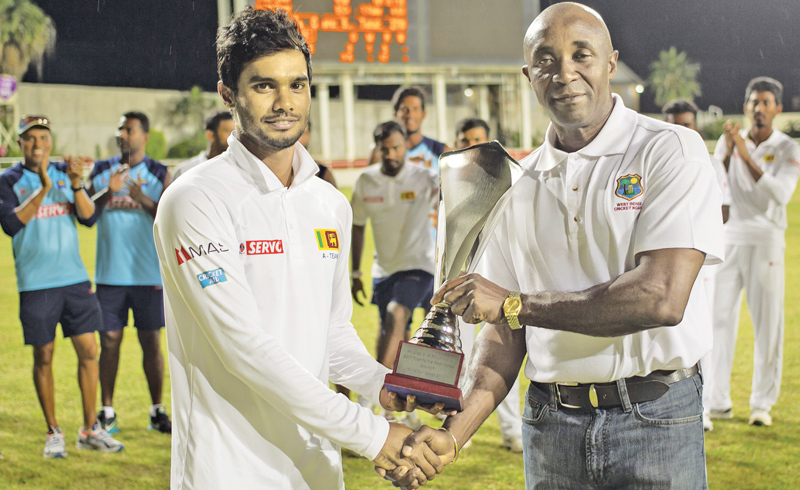 Captain Dhananjaya de Silva, receives the unofficial test series trophy after Sri Lanka won the series 2-1. ‘A’ team tours are normally meant to give exposure to young players and at the same time give opportunities for out-of-form players to get back into form and reclaim their places in the national team. From that aspect Sri Lanka A team’s tour of the Caribbean proved a success. “One of the biggest achievements was getting Dhananjaya de Silva back in form and in the national team. He is a good enough player to be in the Test team but he kind of lost his touch in the last few months. One of the challenges on the A tour was to get him back into the national side which we did and he is back in the Test squad to India,” said Sri Lanka A team coach Avishka Gunawardene. De Silva given the responsibility of captaining the side scored a century and two fifties in his five innings in the three-match 4-day unofficial test series against West Indies A which Sri Lanka A won by a 2-1 margin. The rain-hit three-match unofficial ODI series Sri Lanka A drew one-all. The whole tour Gunawardene pointed out took place at only two venues in Jamaica – Sabina Park, Kingston and Trelawny Multiplex in Florence Hall. “The wickets were fast but the tracks were pretty fair for both teams. The bowlers if they bend their backs and if they actually put revolutions you could get the ball to turn you can get a bit of bounce and get the ball to move. If the batsmen actually put their minds properly you can score runs. The only thing was the whole tour took place at only at two venues which had very slow outfields that probably was one of the reasons why batsmen were at a disadvantage. The scores were a little low than on a normal ground, you could add at least another 40 runs to every total,” said Gunawardene. Sri Lanka A lost the first unofficial test by an innings and 13 runs inside three days but bounced back to win the next two ‘tests’ and with it take the series 2-1. “What you’ve got to understand is that in the first ‘test’ we played with only four batsmen. Sadeera (Samarawickrama) and Roshen (Silva) were supposed to join us but because they were playing against Pakistan the dates over lapsed because it takes two days to get to the West Indies. And when you go to the West Indies you lose a day because we are 12 hours ahead,” said Gunawardene who will continue with his role as A team coach till his contract expires in 2019. “Roshen couldn’t make it and Sadeera didn’t make it to the whole tour. Actually we played with only four batsmen which included our reserve wicket-keeper. Basically it didn’t help our cause but once Roshen was back the middle was good and then we carried on. In the first ‘test’ we didn’t have time to settle down. It was a 35-hour flight (two flights) to get to the West Indies and once we got there we had lost a day because of the 12-hour time difference. It takes a couple of days to get adjusted. These little things contributed towards our defeat in the first ‘test’,” he said. “There is still enthusiasm in the country and their culture in cricket has not changed much. They have kind of moved away from their typical West Indian style of play especially the batsmen. They have moved away from their traditional game and they have kind of taken more to the technical side, maybe because they are having English coaches. Their A team coach is an Englishman. I don’t know whether that influence has made them concentrate more on the technical side,” continued Gunawardene. “The difference I see is that the typical West Indian calypso when it comes to batting is not there. They had their unique way of playing cricket that kind of culture has changed. That is one of the biggest changes I’ve seen in the Caribbean touring there after 12 years. No cavalier approach like the days gone by. The West Indies players of the bygone era didn’t care too much about their techniques each and every individual batsmen had their own way of playing cricket. They might not look good but they were very effective. The bowlers they were pretty much the West Indies style big made, aggressive and fast,” he added.